I found this interesting shell about 20 years ago in Burtonsville, Md. while working as an assistant to a surveyor. I would “comp” the formulas in the field in order to get a quick “traverse” of the properties we surveyed. This was before the computer stuff took over. I was good at it due to my experience as a Quartermaster in the Navy and later as a Navigators Assistant while serving as Third Mate in the Merchant Marine. Anyway, there was an old mobile home on one property and I went in to look around. See what treasures might have been left behind- but expecting nothing. I found this in the kitchen area and it evoked in me the scene from “Grapes of Wrath” where Jane Darwell is going through her old memory chest and finds the pin from the St. Louis Exposition of 1903. It must have meant a great deal to someone a long time ago. At the time internet was still in its’ infancy and I couldn’t find out too much about this bridge, which of course was long gone. 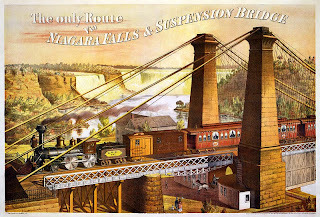 While reading a book today I came across an item mentioning that James Roebling had built a suspension bridge over the Niagra in 1855. I Googled it and came up with a wonderful Wilkipedia article on it. I wondered where the shell was and happily found it in our china closet, way in the rear where it could not be seen. Meantime the shell is out of the closet so to speak, and now occupies a prominent place on the piano.